“I’ve been searching for that narrative that doesn’t go from A to B, but is allowed to wander.” (An Interview with Anouk Vercouter) — H/M. In times that seem endlessly dark, it is more important than ever to find safe havens in shadow. Our third featured artist has made one for herself in art, and now, she is bringing her strength and brilliance to the pages of the nocturne issue. We're so honored to have her on the blog today—we know her insight and grace are the truest home in every kind of night. Please welcome our stunning featured artist, Anouk Vercouter. 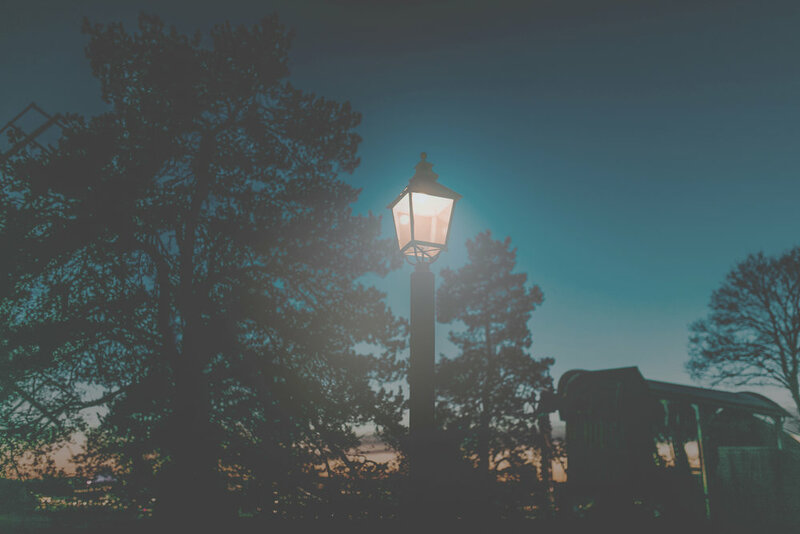 HM: Issue III’s theme is Nocturne: “the midnight drive – the shadow dance – the things leftover when the music fades to black.” What is the significance of darkness to you? To your art? AV: The darkness you describe has always been a vital part of who I am and what I do. I am at my best when the evening falls. I love the way it smells outside, the air of mystery that it creates. 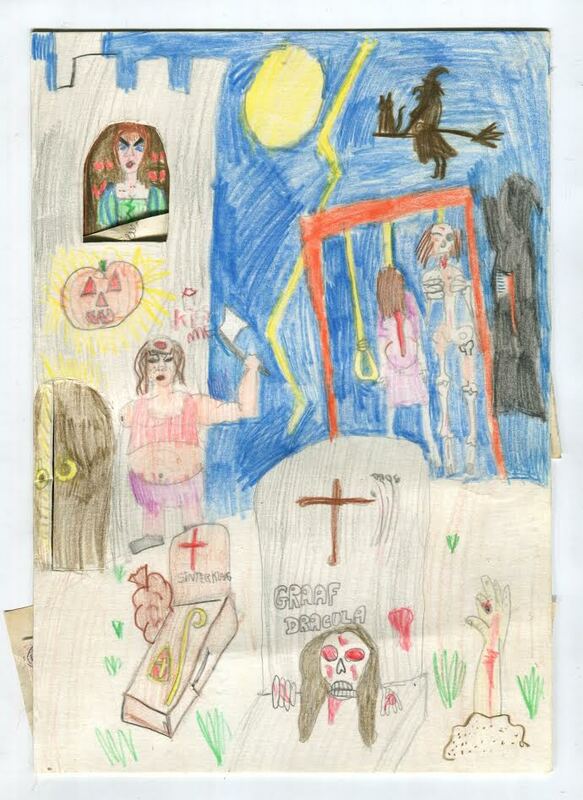 Since I was a child, I had a lot of very vivid dreams and nightmares. Although I grew up in a very loving family and didn’t have to conquer significant traumatic experiences, my dreams were very macabre. But soon, I started to enjoy it in a way: these dark stories were also very beautiful to me. During that period, I started drawing as a way to conserve these moments, and I remember enjoying doing that. When I grew up, I had a moment where I felt a lot of shame for the drawings I’d made, and I feel really bad for throwing most of them away. Another piece of mine, The Anatomy Lesson (2013) is a tribute to my nightmares, a large-scale drawing where I’m subconscious and involved in some kind of procedure. My friends are in the room too, looking at me and holding my hand. The piece is about paradoxes, involving fear and sleep, science and religion, and at the same time it’s an all-female version of Rembrandt’s Anatomy Lesson of 1632. What is the very best time of night? My job requires getting up early, so it’s been a long time since I experienced my favorite moment of nighttime. The best one is definitely past midnight, on hot summer nights. These nights are quite rare in Belgium, and I’m addicted to their scent. I grew up at the seaside, and to avoid the tourists we went to the sea during the evening. At that time, the sea was ours. Last year, my boyfriend and I went to the North Sea together at the end of a very hot day. We were all alone, and when we went for a swim we discovered bioluminescence. A very beautiful experience! Definitely the best time of night. One of the things we here at Half Mystic admire most about your work is its willingness to linger in the grays, to live in ambiguity. Where can that same willingness be found in music? How does that impact you as a listener? It wasn’t that hard to find music that corresponds with my personality and interests. From a very early age, Radiohead has been one of my favorites. Albums like Kid A and A Moon-Shaped Pool touch a certain frequency that keeps me listening to them over and over again. They are my favorite studio-time soundtracks. Next to the spine-chilling tracks, the artwork is spot-on. They seem to understand the importance of inviting people into your world, and that goes beyond the music. They imagine landscapes, not only in sound, but they attempt to make it a visual thing, too, and they succeed to contain the ambiguity of their music that still leaves gaps open for your own interpretation. Another treasure of mine is Nick Cave’s latest album, Skeleton Tree. He’s been through the horrible experience of losing his son, and turned it into a thing of beauty. Although his grief is unimaginable, he invites you to share it, and it’s full of love. At this moment, I’m listening to Bill Callahan’s work on repeat for similar reasons. Glassworks by Philip Glass is also a very good one for drawing. His oeuvre has a lot of affinity with movies, and these sounds contain some kind of narrative aspect that is just perfect for imagining. In that way Arvo Pärt’s Tabula Rasa had a significant impact on me. Together with these tracks, the opening scene of Melancholia (dir. Lars Von Trier) inspired me to create this series, because it sets an atmosphere that goes beyond life. You often stress the importance of surrounding yourself with objects that inspire you. What are your musical surroundings like? How do you navigate that landscape as an artist? The way music can result in objects fascinates me. My boyfriend and I collect LP vinyl albums together, and I like that it makes music visible in some way. I have a weakness for album art, and am proud of my collection. Since I’m working as an illustrator more and more, I would feel honored to be able to put songs into album art. But next to that, of course, having a soundtrack in my studio is a vital part of the process. It adds an extra layer of input, next to the visible, that opens your mind. If you had to choose one, what would you say has been the most striking turning point in your creative life? I think the moment I discovered L’Inconnue de la Seine. 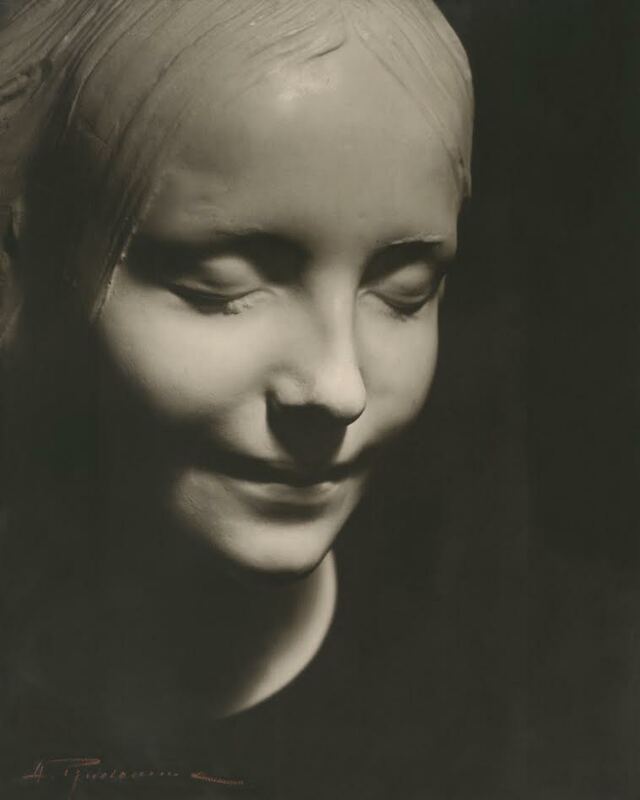 It’s a famous death mask of an anonymous girl, found in the Seine Canal around 1880. Since her body showed no traces of violence, suicide was suspected. However, her death mask became famous because of her smile. I could stare at it for hours. Since that moment, a lot of my work is traced back in some ways to this one. For example, L’Inconnue is a self portrait where my eyes are closed and the things I experience and see are my own. It has an air of mystery that is just magical. Dear Sleeper, one of my recent works, is also a reference to this treasure. When do you need music most? I need it most while drawing. But I also enjoy it a lot in the car. Learning how to drive took me a long time, and music takes away the sharpest edge of my driving anxiety. When my boyfriend and I travel, we prefer long car drives, and picking out the perfect soundtrack is a huge fun part of that. I remember Radiohead’s Kid A as a soundtrack when we were driving at sundown through Pag, a Croatian island that was so dry it looked like a moon landscape. Just perfect. What do you feel is your greatest weakness as an artist, and what do you do to counter it? My insecurities hold me back sometimes. I have a box full of so-called "failed drawings", and tend to throw away a lot of my work. Lately, it takes a long time until I think a piece is finished, because I can always keep working on it. When I’m packing drawings for a show I sometimes add changes while packing—not a good habit. I have the feeling that every drawing has to be better than the last one, and that’s not always good for my art. You describe yourself as an artist who aims to “uncover a unique story into the individual viewer’s imagination.” What are the techniques you use to achieve that? I used to create work that had one focus, one subject, that was mostly readable in one way. One day, when I was cleaning my studio, I started to hang all kinds of things (pictures, toys, dried flowers…) on my wall. I thought it was interesting how there were stories and links growing out of these objects that were, in a way, related to each other. This resulted in my Wall Still Lives series, where I portrayed those pieces hanging on my wall. Instead of wanting people to understand what I’d made, I was curious about what they perceived out of it. Since that moment, I’ve been searching for that narrative that doesn’t go from A to B, but is allowed to wander. To expand on that: do you believe every viewer’s incarnation of that story has a sound? What about the viewer does it depend on? Is there anything you hope they hear? Of course, the links we make when we see something cannot be purely visual. Every person has a unique, rich mind that is a patchwork of knowledge, emotions, and memories that are indeed visual but connected to our other senses, too. About that, there is nothing I hope they hear. When they indeed hear "something", a text, song, sound, conversation… that is already a success for me. I don’t want to push people into one direction; their individual reactions interest me. What do you aspire to be as an artist? In my life, I’m hoping to have as many experiences of beauty as possible. I modestly attempt to create pieces of beauty myself. If my work can give other people these experiences too, that’s wonderful. It’s a process of giving and taking, and I hope to keep a good balance that way. Bio: Anouk Vercouter, born in 1991 (Ostend, Belgium), lives and works in Ghent, where she graduated as a Master in drawing and printmaking at LUCA School of Arts. Anouk's work is especially triggered by the period in art history where fine art and the representation of beauty disconnect. She expresses the results of her romantic vision by effortlessly drawing on paper, mainly in graphite or coloured pencil. The artist, whose oeuvre is situated between visual art and illustration, reaches out to her viewers by inviting them to join her on a trip into the imaginary. Her ambition is to never impose an unambiguous interpretation but to hand out only a few "props" in order to uncover a unique story into the individual viewer's imagination. The diversity of the storylines and the unrestricted associations revealed by her drawings, contaminated by the carefully chosen objects that the artist surrounds herself with in her studio/Wunderkammer, excite her imagination and force her to draw, continuously.